Regardless of whether your little 4-year-old girl goes to playschool or stays at home, she is a very busy little lady. At this point, she is able to communicate much more clearly and has picked up a wide variety of skills along the way. Apart from walking, talking, and interacting with kids and adults, she is able to manage quite a lot of things for herself. Instead of relying on you to do everything, she enjoys dressing herself, organizing play, and taking care of her own set of chores. You may be amazed at how determined and capable she is, while, no doubt, you enjoy discovering what kind of personality she is developing. When it comes to buying her toys and gifts, you want to choose them to suit her age, helping her to grow, learn and develop further. Thankfully, the choice of toys and gifts for 4-year-old girls is amazing. In fact, it may be a little overwhelming. To make your choice a little easier, I have put together a list of toys my little girl loved, while also including toys recommended by other parents. Take a look and find the perfect toy for your little girl. Also, don’t forget to check out our buyer’s guide toward the end of this comprehensive list for some extra tips. 15. 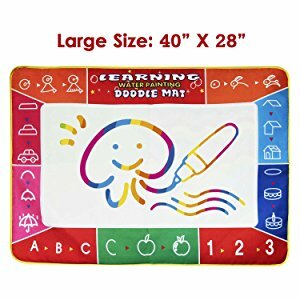 Monilon Aqua Doodle Drawing Mat, 40" X 28"
Does it Have Educational Benefits? Will She Be Able to Play with It When She is Older? Can She Enjoy It on Her Own and With Others? Does It Broaden her Skillset? Would You Like Her to Go Outside and Stay Active? Will She Enjoy It and Have Fun? This pogo jumper encourages exercise and physical activity. Thanks to the foam base, this pogo stick is suitable for little ones. Nonetheless, many adults will love it just as much. As you know, this toy is simple fun. The kid (or adult) stands on the base and hops around. In fact, after a while this is quite a strenuous activity. Except, your little girl will be having so much fun that she wouldn't even realize that she is also keeping fit. To add to the fun element, this pogo jumper has a built-in squeaker, so it will be even funnier. Balance, coordination, and stamina are just some of the things she will learn with this toy. ​If you would like to inspire your little girl to get active, this toy might be a top choice for you. What’s Great About It – This foam pogo jumper is suitable for indoor and outdoor play. Both kids and adults love it, and it gets everyone off the sofa. A lot of toys on the market do not encourage physical activity, so it’s great to see one that gets kids exercising. If you want to stimulate your little girl’s creativity, look no further than this pop bead set. Containing no less than 500 beads in different shapes and colors, there’s no limit to what she can create. What’s especially great about these beads is that they snap into each other, so she won’t need to use any string. And, when she wants a change of style and design, she can just take them apart and start anew. The beads come in a convenient box featuring different compartments for easy storage. On purchase, you get 15 different bead shapes, 12 rings, and 7 bracelets, all in 12 different colors. Because the set contains so many beads, she can easily create a whole jewelry collection. While this set will keep your little girl busy for hours on her own, she can have her siblings or friends join in too. My little girl often made her jewelry and ended up organizing a little fashion show with her friends to show off her designs. 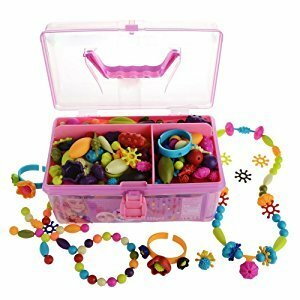 What’s Great About It – With this set, your daughter’s fine motor skills and hand-eye coordination really get a fun workout. Besides, her creative spirit can grow and develop. In the end, your little girl will have a great sense of achievement and pride when she shows off her jewelry designs. Finally, this pop art bead set will grow with her and suit her for a few years to come. 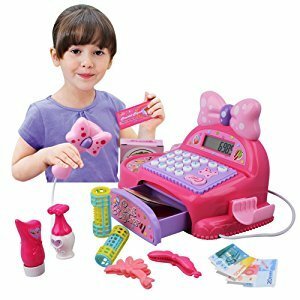 Playing shop is fun, and with this pretend cash register, your little girl will have everything she needs. Apart from the pink cash register with coins and notes, she’ll get hair clips and rollers. That way, she’ll be ready for a hard day’s work at her very own shop. Role playing is an important part of child development. This pretend cash register is a great introduction into shopping, dealing with money, counting and budgeting, as well as basic math skills. Without even realizing it, your little girl will learn an array of invaluable life skills while having lots of fun. You can be her best customer or encourage her to buy something at your shop – the possibilities are endless. In the process, she’ll also learn about the different kinds of stores, what each one sells, and how to make a shopping list. As this toy is best suited to joint play, she will further develop her communication skills and learn the basics of negotiation. This pretend cash register requires 3 AAA batteries for the realistic sound effects, as well as the LCD screen. What’s Great About It – This is a fun introduction into math and money, helping your little girl to come to grips with adding and subtracting. While she may not fully grasp all the different functions when she is 4 years old, she will learn the numbers over time. As a result, this pretend play cash register can provide lots of educational fun for years to come. With this double-sided easel, your little girl can have fun when she’s 4 years old, and she’ll still use it when she is a couple of years older. Apart from writing, drawing, and painting, she can play pretend school with her siblings or friends. The drawing board on either side of the easel measures 22.4” x 18.47”. On one side, you’ve got a traditional chalk board, while the other side features a whiteboard. As the length of the legs is adjustable, you can ensure that the boards are at just the right height for your little artist. In addition, the easel features a clip at the top, so you can attach whatever size piece of paper you have at your disposal. Finally, the legs have non-slip feet, so the easel doesn’t move while your kids are using it. When you buy this easel, you get a whole lot of accessories, including magnetic numbers and letters, whiteboard markers, erasers for both sides of the easel, chalk, and magnetic beads. The easel also features a container for all the different accessories. What’s Great About It – This toy provides all the tools to encourage creativity and learning the old-fashioned way. Kids use their imagination in whatever they do, while learning basic drawing, math, and writing skills. 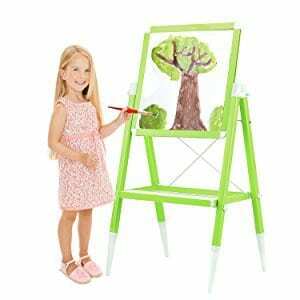 Together or alone, with this easel, your little girl will have lots of creative fun. This magnetic building set is amazing. Your little girl can transform 8 magnetic story walls into a castle or a house, creating a different story and structure each time. Once built, her creation becomes a playhouse for the beautiful wooden characters. On purchase, you get 79 different pieces, including the story walls, characters, clothing, and accessories. Each time she plays with this set, she can set a different scene and tell a different story. This set is suitable for solo and joint play, with plenty of variety for fun too. Unlike bulky dollhouses, this one packs away in a few moments, making it super portable. As the illustrations are beautiful, the castles she builds are going to be stunning. What’s more, assembly is child’s play so any 4-year-old child can build a magnificent structure within minutes. What’s Great About It – These beautiful story tiles transform into a castle and provide the setting for lots of imaginative play. 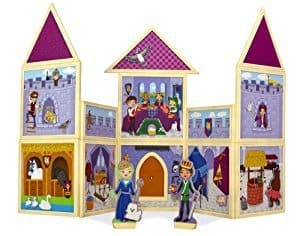 Apart from developing her fine motor skills, little girls can be queen of the castle and let their imagination run riot. If you would like to instill a love for the great outdoors in your little girl, this pair of binoculars can help. Kid-friendly and easy to handle, these binoculars are the perfect exploration tool on camping trips, hikes, or on forest adventures. 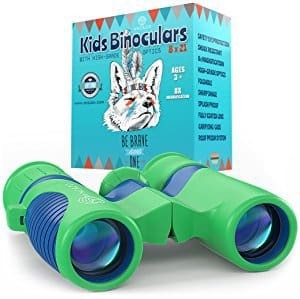 Thanks to the design, these binoculars are great for kids aged 4 years old and above, as they are easy to focus and they are made from durable, softened rubber. Even though they are made for kids, these binoculars have great 8x magnification. This makes them perfect for bird-watching and spotting wildlife. The smallest hands can handle the focusing wheel as well as the diopter adjustment. As they are made from rubber, they can withstand a good deal of wear and tear, while remaining safe for your kid to use. ​These days it can be difficult to get kids to play outdoors. But these binoculars will help your little girl to discover nature and wildlife. What’s more, she’ll also be able to use them to look at distant cityscapes while traveling. What’s Great About It – No doubt, these binoculars are perfect for kids from 4 years and up, awakening their curiosity for nature and adventure. I also like the fact that the view is crystal clear. In addition to this, they are made with durable rubber, so it doesn’t matter if your little girl drops them once in a while. The detachable strap is an added bonus and rounds off the appeal of these binoculars. At some point, every little girl wants a puppy. 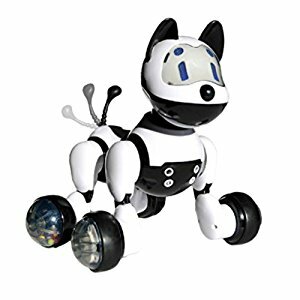 With this robot dog, she can have lots of fun without the responsibility of owning a dog. This little dog is really smart. Apart from understanding 15 different commands, he displays his emotions by changing color. Dancing, scooting around, walking, and even singing are no issue for him as he can do it all. When you press down on his head, he acts like a real-life puppy, barking, dancing, and singing. Press down again and he responds to your commands. ​This little dog introduces your 4-year-old to pet ownership, while allowing her to pretend she has her very own puppy. Kids aged from 4 years and up, and even adults get great fun out of this toy, so she’ll have a toy that will grow with her. What’s Great About It – This is a very interactive toy, ideal for role playing and imaginative fun. Measuring 8” in length and just over 9” in height, it’s very portable and great for on-the-go fun. Most little girls adore the idea of having a puppy, and this little electronic dog is the next best thing without the mess and responsibility. Now that your little princess is 4 years old, she is ready for her first Barbie doll. With this set, you get a Barbie that wears a color-changing bathing suit, a swimming pool, as well as a dog and a puppy. 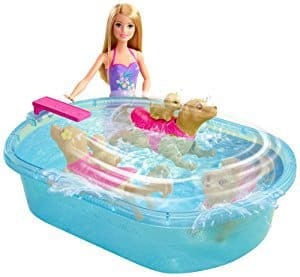 Barbie can have a swim by herself or have the dog and puppy splash around with her. When your little girl presses the button on the dog’s back, she begins to swim. What’s more, your little girl can attach the puppy to her mom and the two of them can swim around the little pool together. Inspired by the movie “Barbie and Her Sisters in a Puppy Chase”, this set provides hours of fun and imaginative play. When traveling, your little girl can leave the pool behind and just bring Barbie, the dog, and the puppy. As your little girl grows, she can use Barbie for an array of pretend play games, on her own or with other little Barbie fans. Though Barbie dolls have been available for decades, today’s little girls love them just as much. They are durable and provide endless options for girlie fun. What’s Great About It – Your little girl will love this set for many years. While she may focus on the pool and puppy to begin with, she’ll soon broaden her horizons and use Barbie for dress up and party fun. In some ways, Barbie dolls are timeless. So we just had to include one in our selection of best toys and gifts for 4-year-old girls. In my opinion, magnetic tiles make for a great gift choice for little girls. To begin with, they introduce kids to design and architecture, while also providing hours of creative fun. The structures that emerge look fantastic, giving your little architect an incredible sense of achievement. In this set, you get 60 tiles, including 4 different colors and 9 different shapes. Thanks to the strong magnetic edges, building magnificent 2D or 3D structures is easy, regardless of whether you are 4 or 44. During play, your little girl learns about symmetry, planning and strategizing, and about economizing the colors and shapes. As a result, she’ll master many skills and get great joy out of her masterpieces. Fine motor skills, design, and basic architecture are just some of the areas she’ll experience. In addition, she’ll be able to play with this set on her own or create awesome buildings with you, a sibling, or a friend. Conveniently, the magnetic tiles pack away into the little bag included in the set. What’s Great About It – This set inspires creativity and develops visual and design skills. While the creations are always impressive, even the smallest hands manage to construct them with ease. As she gets older, her designs will get more complex, providing just as much fun and variety for creative expression. The portability of this set is an added bonus, along with the fact that little girls can enjoy playing solo or with a friend. With this stamp set, your little girl can make beautiful pictures and greeting cards in minutes. We’ve chosen the rain forest-themed set, but you can also get a farm or a garden-themed set. The two ink pads supply strong colors, while the definition on the stamps is quite detailed. 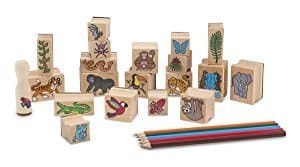 The stamps are made from wood, with each featuring a different animal on the body of the stamp. While your little girl creates wonderful scenes, she can learn about the animal kingdom. Creativity, drawing, and tracing are just some of the skills that come into play here. Hand-eye coordination as well as combining drawing and stamping add to her skillset. ​As she creates wonderful pictures combining her own drawings and the animal stamps, she will feel a great sense of achievement. ​There’s nothing very high-tech about this set, yet it provides plenty of educational fun and scope for growth and development. ​My little girl stamped absolutely everything from paper to old t-shirts, right through to her bedroom walls. What’s Great About It – This wooden stamp set is durable, user-friendly and perfect for your 4-year-old daughter. While she plays and creates, she’ll learn about the jungle, farm, or garden. When’s she’s done making beautiful pictures or cards, she’ll know that she can create wonderful things. Teaching your kids all there is to know about growing fruit and vegetables is a great way to inspire them. 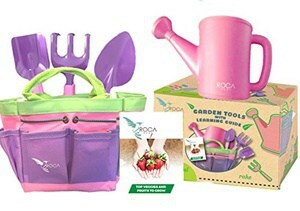 With this set, your little gardener learns about gardening, and you can bring her outside and help her to put what she has learned into practice. When you buy this set, you get gardening tools, a bag, and a STEM Early Learning Guide. The guide provides an introduction to growing fruits and vegetables. No doubt, with your green finger and her newly acquired knowledge, you'll both enjoy planting, harvesting, and eating the fruits of your labor. Apart from learning about growing food, your little girl also becomes aware of the importance of eating fruits and vegetables. This has proven particularly important in recent years. In that sense, this set inspires healthy outdoor play and good nutrition all at once. ​This set is perfect for interactive educational play between adults and kids. As a result, this might be one of the best gift options for your child. What’s Great About It – Not many toys inspire healthy outdoor play with an educational purpose, but this one does. If you are willing to introduce your little girl to the joy of gardening, you may be setting her up with a pastime she will enjoy for the rest of her life. My little girl and her siblings had so much fun playing with these walkie talkies. What’s more, the adults loved them just as much. With this set, your little girl can communicate with her little friends from one corner of the house to the other. They even work in the garden. In fact, the maximum range is a whopping 2 to 3 miles. Using these won’t be difficult for your little 4-year-old. While she’s talking, she doesn’t even need to press any buttons. Even better than that, the sound is clear, so communication is easy. When she’s walking, she can clip her walkie talkie onto her belt with the convenient clip. These walkie talkies take 4 AAA batteries, which last 3 to 4 days on standby. Selecting a channel is also no issue with the user-friendly scan button and the signal indicator on the walkie talkie's screen. At the beginning, I thought my 4-year-old would struggle to use all the different buttons, but before I knew it, she had it all worked out. Soon, she took them everywhere, and she invited her friends over for a game of “walkie talkie hide and seek” and whatever other great imaginative games they could come up with. 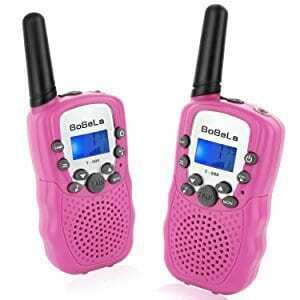 What’s Great About It – To my mind, every little girl should have a set of walkie talkies. To begin with, they provide lots of fun play, while helping to develop communication skills. In addition, they are the perfect precursor to cell phones. They come in pretty girl pink and a variety of other colors, and they are the same size as an average smart phone. Playing games with your kids helps them to interact, learn about rules, develop strategies, and have fun all at the same time. For that reason, I wanted to include a game that your little 4-year-old girl will enjoy as much as you. And what better game is there to choose than Go Fish? It’s easy to understand, yet lots of fun. In this set, you get beautiful animal cards, ideal for playing the game as well as teaching kids about the native wildlife. 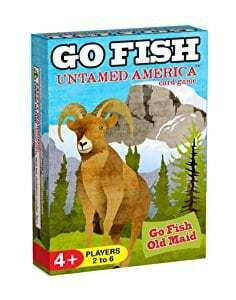 Apart from Go Fish, you can play Old Maid as well as the card game designers’ own match up game. 2 to 6 players can participate, and your little girl can learn to recognize, count, and match up animals. What’s more, she’ll learn to win and lose, while also discovering animals she may otherwise never have come across. ​The cards are just the right size for small hands, and perfect for vacations or long flights. What’s Great About It – This 3-in-1 card game set provides fun for the entire family. Have fun, play together or all against one another, while learning about native US wildlife. Though she may not always win, the importance of joint play mustn’t be underestimated. Have you ever met a little girl who doesn’t like high heels? Well, this little boutique might be your little girl’s dream. With it, she can pretend to be in charge of her very own shoe boutique. No doubt, she’ll love it. The set features a mock shop shelf displaying 4 fashionable pairs of heels, along with 2 pairs of earrings, 3 bangles, and 3 rings. After she’s tried to master the art of walking in high heel shoes, she can go on to selling them to her friends or siblings. This type of imaginative play will help to build her confidence as well as her self-esteem. What’s Great About It – With this set, little 4-year-old girls can engage in fun pretend play. The shoes and jewelry are going to make her feel like a princess when she’s wearing them. What’s more, she’ll have a real sense of pride when she is pretending to be a shoe boutique owner. When I first discovered aqua doodle mats, I was amazed, and I still think they are one of the best inventions ever. What you get is a mat and some water pens. After unscrewing them and filling them with water, you screw the pen tips back on. When you start to draw on the mat, the rainbow colors inside the mat come through. That way, your little girl can doodle to her heart’s content. There is absolutely no mess. What’s more, after she’s done drawing the mat dries out and she can start afresh the next time around. If you are wondering if your carpet is going to get wet, well, you need not worry. Because the back of the mat is made of plastic so no moisture gets through, leaving all surfaces dry. What’s Great About It – This reusable drawing mat is a fantastic canvass for any little girl. She can let her creative juices flow, while you get no messes, and she can use it time and time again. Most little girls love cuddly ponies, and, no doubt, they’ll adore this one. 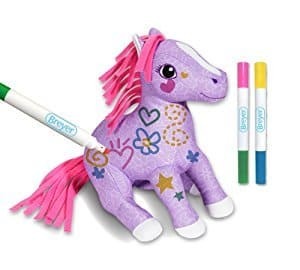 When you buy it, you get 2 special markers that your little girl can use to personalize the pony. Each marker includes two tips in different colors, so all in all she gets 4 colors. She can draw on the pony in whatever way she likes and make it all the prettier. When she wants to change the design, you can throw pony into the washing machine, so she can start over. Apart from providing all the benefits of a cuddly toy, this one gives her full scope for creativity and self-expression. What’s Great About It – I love the fact that little 4-year-old girls can create new drawings many times over, making it special every time. Besides, they can also just enjoy having a cuddly pony. 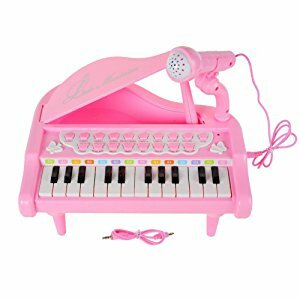 With this multi-instrument sound piano and microphone you can awaken the singer and musician in your little daughter. In pretty pink, this piano has lots of different features. To begin with, it plays the sound of 4 different instruments. Secondly, it has 22 different demo songs. In addition, it features 8 different rhythms along with a microphone. Finally, your daughter can record the music and songs that she plays. So, you see, this little piano can teach your 4-year-old the joys of music and singing, which will inspire her to participate, sing, and play. There are 24 keys on the piano, which are just the right size for her little fingers. What’s Great About It – This piano introduces kids to music, inspiring them to sing and play along. As there are so many different functions and buttons to press, she won’t get tired of this toy in a hurry. 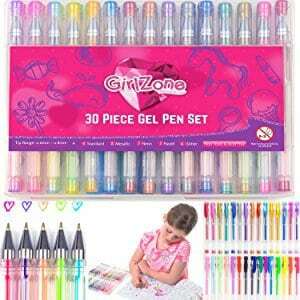 Giving your 4-year-old girl a big box of wonderful gel pens might just be one of the best ideas yet. This set of 30 gel pens features all the wonderful colors you’d expect, along with some glitter and neon pens. At just the right size for small hands, the tip glides effortlessly across the page without skipping. The ink flows well so the drawings and designs your little one creates are bound to be stunning. Beautiful handwriting, drawing, and doodling are easy with this set, and she’ll be keen to put her skills into practice. What’s Great About It – It's nice to see so many colors in one set. These gel pens roll easily so your 4-year-old girl won't have any trouble getting creative or practicing their basic writing skills. If you would like to give your 4-year-old a head-start in school, then this Scribble and Write pad might be a great choice for her. 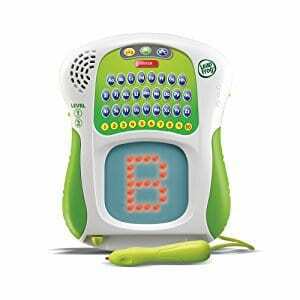 Featuring a keyboard with all the letters and numbers from 1 to 10 alongside a drawing board and special stylus, the board displays letters and numbers for your 4-year-old to trace. This scribble board has two different levels, designed to teach your kid basic writing as well as letter and number recognition skills. During level 1, your daughter is encouraged to scribble, while during level 2, proper handwriting techniques get a workout. The feedback is immediate, so she’ll know if she’s doing it right or if she needs to improve a little. What’s Great About It – Apart from introducing basic writing skills, this toy also features lots of different activities, all designed to make learning fun and engaging. 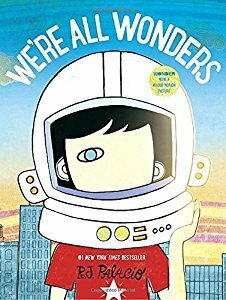 This wonderful book follows on from the motion picture “Wonder” and inspires small kids to “choose kind”, celebrating the uniqueness of each and every person. This book tells the story of Daisy and Auggie’s adventure in fun words and awesome pictures. What’s Great About It – What’s not to like about a wonderful book that will inspire kindness in your 4-year-old daughter? So, that’s our selection of top toys and gifts for 4-year old girls. Naturally, we’d like to add a whole lot more because there are countless great toys available. Nonetheless, the above toys give you a good variety, and it’s up to you to choose a toy for your little girl. When choosing a toy for a 4-year-old girl, you need to consider a few points. For starters, you need to remember what stage she is at. She is able to communicate and interact at a much more advanced level. In all probability, she is looking forward to starting school. Perhaps she’s already learned a few letters and numbers. Remember, a couple of years down the line, your little girl will start school. Would you like to prepare her for that big step? Would you like her to learn basic math and language skills? If educational development is a priority for you, choose a toy that provides learning opportunities for your little girl. Looking at our list, you can choose the easel or the pretend cash register, if skill acquisition is your prime concern. Make sure to buy a toy that she will still enjoy playing a couple of years down the line. The toys on our list can all go the distance, allowing her to play at a basic level now and move up to more advanced stages when she’s older. Age-independent toys are best and often become treasures for kids over time because they get so much use from them. Think of your little girl’s social environment. Does she need a toy that she can share or one that will keep her busy while she’s playing on her own? What type of toy is she going to get more use out of? Would you like to encourage her to play independently or jointly? No doubt, toys that allow her to play on her own and with a little friend are best. In addition, you may also like to choose a toy that the whole family might enjoy along with her. Your little girl is learning new skills all the time. Does your chosen toy help her to do learn more? What skill can she learn with it? Matching, math, reading, writing, creative play, socializing? Most toys are designed for indoor play. Perhaps you would like your little girl to go outside and explore nature instead. 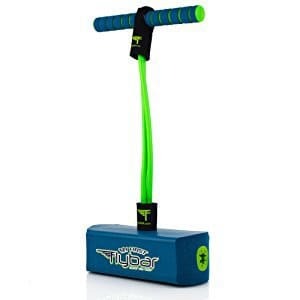 Consider toys that may have the ability to be used both inside and outside, like the Pogo Jumper. Try to put yourself in her shoes and choose a toy that she’ll have fun with. After all, it’s as much about fun and enjoyment as it is about learning. Unless a toy is fun to play with, she’ll just leave it aside, and you’ll have wasted your money. What does she enjoy most? What new things could you introduce her to? Choosing a toy or gift for a 4-year-old girl is not an easy task because of the sheer abundance of toys available. You know what she’s like and what kind of toys she enjoys. When trying to make a selection, you need to set your own priorities while catering to her needs. Ask yourself all the questions above and you will soon have chosen a great gift for your little girl. Most importantly, choose one that she’ll have fun with. The toys on our list offer a good variety of options; you just need to decide what kind of fun you would like her to have. And if the toy helps her to develop and grow, it’s even better. In the end, no matter what toy you get for her, she’ll be happy and hopefully enjoy it for years to come. While playing, she’ll learn and have a laugh, and you can be there to guide her.